1th 7am Rituals of the beginning of new year. The festival with offering of food and alcohol (offerings) to gods and prayers for another year of prosperity of the Imperial Family, world peace, the security of the country and great happiness of all people. to 3rd All day long In the first 3 days of the new year every year around 30 000 visitors come to the shrine from all over Japan to pray for fulfillment of their wishes throughout the year. And for those who came for their first visit of the New Year we prepare and offer free of charge hot green tea. Our toilets are also available to the public, so if in need feel free to use. January 10th 10am The first day of the Great Deity of Konpira for the year. Unfortunately there are no street stalls and stands but many monthly visitors and worshipers come to the shrine. Especially those who were unable to break off a bad relationship and wish to finally succeed this year are welcome to visit on this day which is deeply related to the Great Deity of Konpira. From Konpira Closing Festival of previous year December 10th to this day, we distribute a lucky charm “Ina Horai” amulets. spring 10am From February 1st to the day of Setsubun Festival a special box for old amulets and charms will be set on the premises. If you have any old lucky charms, amulets, talismans that have not fulfilled your wishes or any other kinds of charms you may bring them and leave in the box. From the next day after Setsubun Festival a priest will take a few days to cleanse, purify and burn the charms. 1:30 pm Great Spring Festival. After performing the Great Festival Ceremony at the main inner sanctuary, a goma altar will be set in front of the “power stone monument for breaking off bad and initiating good relationships” in order to ceremonially burn the votive wooden sticks with parishioners and worshipers wishes written on them, used to pray for wishes to come true. That day a stand with tea ceremony and “oden” dishes will be also set on the premises. June 30th 6pm Ritual of purifying HITOGATA (human shape charm) with transferred sins and vices of the believers, to exorcise all the sins and vices that believers have unknowingly accumulated during the half of the year. This is an ancient Japanese ritual to grant a healthy and safe summer with refreshed body and soul. The Great Purification is performed twice a year on June 30th and the New Year’s Eve and during the Summer Great Purification a big ring made of cogon grass is paced in the front shrine. It is said that jagged leaves of the cogon grass will remove people’s impurities, so going through the cogon grass ring has such a meaning of purification. Especially those, who wish to resolve their daily anxieties and worries, and are wishing for a new start, or who have had one misfortune after another and have much to worry about should transfer their vices to the human shaped charm to be purified. HITOGATA (human shape charms) will be available from June 15th at a reception desk. After writing down your name on the HITOGATA (human shape charm), stroke your body with the charm and next breathe 3 times on the charm to transfer your impurities to the HITOGATA charm. 2pm This festival is for purifying and memorial services to express gratitude to old used combs and ornate hairpins. Since September 1961 on the northern side of the compound a KUSHIZUKA (a comb grave mound) was built, for combs that bring out the beauty of hair that is most essential for women and offers divine favor for women’s beautiful figure, face and hair. From 1 pm a ceremony will be held in front of the mound to deposit into the mound the combs brought by believers and in the shrine hall the dance “Black hair” will be performed as an offering to the deities. From 2 pm after a short lecture about traditional hair styles and costumes a procession of traditional costumes will proceed around the vicinities of the shrine and the Gion area. All the traditional hair styles, from the ancient times of Great Grave Mounds to the present day Maiko, are made with natural hair and require very skilled techniques to implement. Every year members of Kyoto Beauty Culture Club recreate traditional Japanese hairstyles. You are most welcome to enjoy the beauty of Japanese hair, especially the wonderful styling skills and views proceeding through typical Kyoto streets of the Gion district just as depicted in an ancient scroll. The procession will be cancelled in case of rain. ー The most important festival of the year. 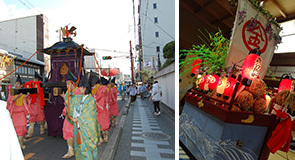 During the Jinkōsai the spirit of the deity enters MIKOSHI (mobile shrines) and taking the shape of a treasure boat travels around the living quarters of the parishioners. Since the mobile shrines are placed in the worship hall in front of the main sanctuary between the SHUTSUGYO and JINKŌSAI, this is the only time of the year when the presence of the Great Deity, who normally resides behind the closed doors of the main sanctuary, actually moves physically closer to believers. Please enjoy the even closer presence of the Great Deity of Konpira in order to receive all the blessings. The main events during the annual festival are as follows. October 1st 9am The first ritual of Konpira Great Autumn Festival. At the 3 gates of the compound so-called Imidake (Purifying bamboo) are erected and a rope is stretched around to prevent impurities from entering the compound during the period beginning that day and ending with the festival for the return of the mobile shrines to storage and prayers for the successful completion of the Great Festival. October 10th 11am The shrine’s most important ceremony of the year. The ceremony is held in the main sanctuary in the presence of parishioners and worshipers with offerings from the sea, rivers, mountains and fields. (Friday) 8:30am OMIKOSHI (mobile shrines), mobile shrines for children, flower carts and Deity treasures are taken out of storage and decorated. (Friday) 8am Ritual of transferring the spirit of deity from the main sanctuary to the OMIKOSHI (mobile shrine) and mobile shrines for children. The deity moves from the main sanctuary in complete darkness with the compound lights off. Since this is a silent ceremony of most importance, during the actual transfer photographing is not allowed. (Saturday) 7pm Making rice cake is made by parishioners on the shrine compound. These cakes are formed into a round shape called KAGAMI MOCHI and offered for OMOKOSHI (mobile shrines and mobile shrines for children) where the deity has moved the day before. (Sunday) 11am With the accompaniment of KAGURA (court music), the main sanctuary doors are opened, prayers are recited, such as prayers for safe procession, prosperity of the Imperial Household, safety of the country, world peace and happiness of all parishioners and participants. After the rituals are completed, a SHISHIMAI (Lion Dance) is performed in front of the ceremony hall. (Sunday) 2:30pm With numerous deity treasures offered and KAGURA music played OMIKOSHI (mobile shrines), treasure boat carts and the Lion Dancers walk around the parishioner’s quarters. Monday) 9am The last ritual of the Konpira Great Autumn Festival. Giving thanks and reporting before to the deity that OMIKOSHI (mobile shrine), mobile shrines of children were returned to the storage and that the whole festival was concluded safely. 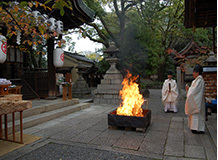 November 10th 11am Wooden Goma Sticks that have parishioner’s and worshiper’s wishes written on them are burned in the garden in front of the main sanctuary and prayer is held for fulfillment of those wishes. It is also said to be a festival of gratitude for Autumn Harvest and prayers to safely pass the winter; also to increase divine power by warming the earth, during the period of increasing cold. Due to ancient customs, red and white fire sweet buns are offered to the deities. December 10th 10am The last Day of the Konpira Great Deity of the year. From this day to the first Konpira Festival of the next year “INAHORAI” charms are available at the reception. December 31st 5pm On New Year’s Eve the ceremony for purification of sins and vices incurred during the second half of the year and to welcome the coming year. In the same manner as for Great Summer purification, people’s sins are transferred to HITOGATA (human shape charms). 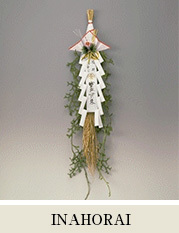 For those interested “The new year HITOGATA” charms are available at the reception from around December 15th. every month	11 am 11am Every month on the 1st and 10th , the day of the Great Deity of Konpira, food and alcohol is offered to the gods, and prayers for prosperity of the Imperial family, world peace, safety of the country and happiness and health of the parishioners and worshipers are held.